You may recall, my husband and I spent the weekend in the mountains. And, we enjoyed watching Dish Network’s Earth channel. Though many may find such a channel boring, my husband and I found it intriguing and amazing. I also found looking ‘down’ on planet earth both humbling and startling. At night, while in the mountains, my husband and I sat on the deck for hours, staring at the countless stars. In the morning, we were literally awakened to the sunrise, watching it take place through the sliding glass doors in the bedroom. And, during the day we spent our time reading, writing and watching ‘planet earth’. Life is good. Life is great. Life is happening all over this world, as I live it and see the earth upon which I live. I wonder what would happen if every public place had a streaming video of our earth. 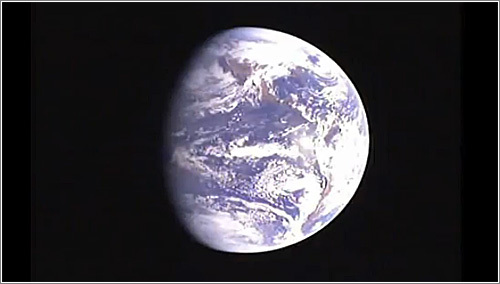 What would happen if everyone could see a live shot of earth from space at all times? Would we be moved to better protect our environment? Or, would we become quickly desensitized by the constant reminder of our Big Blue Marble? As I watched the shot of earth from space, I could not help but think that we are the dust mites of the earth. From a distance, we are microscopic organisms feasting off its host. And, when we think of dust mites infesting our beds and linens, we shudder. Yet, viewing the earth from space, I can’t help but think we are the very things that make us shudder. Unfortunately, dust mites are – for the most part – harmless. Humans feeding off planet earth? Not so harmless. Earlier this week, as I mentioned in a previous post, Joe lost his first tooth. Though the tooth was loose for weeks, the ‘fall out’ seemed to happen suddenly and unexpectedly. And, because we don’t do the Easter Bunny or Santa (in the traditional sense), I had no clue how we’d handle the Tooth Fairy. After their bath, Joe informed us that he was hoping he was going to get an ice cream sandwich or a lollipop from the Tooth Fairy. I told him I doubted that would happen. And, I reminded him that the ice cream sandwich would melt. Though, perhaps he was thinking he’d wake up in the middle of the night and eat it. Who knows. When Joe was in bed, I crafted a little note to include in the pouch with the quarter. I had a feeling Joe was going to be disappointed, but I was hoping the simple ‘thought’ of a Tooth Fairy coming in the night would be enough to please him. Yeah. Not so much. He didn’t see the quarter initially, just the note; and, he was disappointed. I told him there was a quarter in the pouch, too, but he told me he didn’t want it. Ironic, because it was his quarter to begin with. I wonder if this means I can keep it?! Why, he asks. Does she want my tooth? Searching for answers is this little sleuth. Why under the pillow? Why on my bed? How can she get it? Will she lift my head? The ways of the the fairy, the elf and the bunny. He shakes his head, finding it all kind of funny. This week I started a 2nd job – a paid gig. I am helping friends handle the ‘night shift’ of parenthood. They recently celebrated the birth of their second child. And, wishing they had a ‘night shift’ helper with their first child, they put a plan in action to have help with the second. So, two nights a week from 11PM until 7AM, I do what I can to let Mom and Dad sleep (though Mom does wake up once to nurse the newborn). It’s kind of nice taking care of a newborn again. I feel like a grandparent – able to enjoy the little baby, while handing the cutie off to her parents at the end of the day. Um. Wait, I hand off the baby at the beginning of the day. Yes, just two nights into my job, and I’ve already lost track of the days. When I came home Thursday morning, it took me all day to realize the day was Thursday not Wednesday. And, perhaps because I am in my 40s, I find recovering from an all-nighter takes more than one night to recover. As the sun sets on this Friday, I feel my energy starting to return. Yes, just like a newborn, I may be getting my days and nights mixed up. Sure hope I don’t wake Rob up tonight by crying out for a bottle. That would be awkward. The memories of my babies as newborns are foggy. Perhaps because much of it was spent feeling groggy. A full night of sleep did not exist in those days. So often we walked in a sleep-deprived haze. And when sleep is something that you lack. The days of the week become harder to track. Thanks for Reading. Be good yourself, and help take care of others.